Image caption Judges described Salisbury as a "divinely attractive and welcoming place"
The city which was the scene of the Russian nerve agent attack has been named the best place to live in the UK. 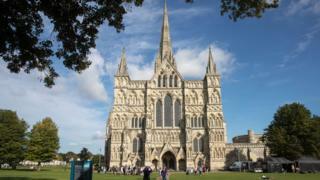 Salisbury in Wiltshire was chosen by the Sunday Times Best Places To Live guide because it "remains a divinely attractive and welcoming place". Former Russian spy Sergei Skripal and his daughter Yulia were exposed to Novichok in the city on 4 March 2018. Military personnel spent months decontaminating various sites in the city after the incident. The list was compiled by a judging panel using their expert knowledge alongside statistics, including house prices, school league tables and air quality levels. Salisbury MP John Glen tweeted: "Great decision by The Sunday Times - a fantastic city with a resilient spirit, world class tourist attractions, exciting independent shops, top quality schools and infrastructure fit for future generations." Dawn Sturgess, 44, died in July after coming into contact with a perfume bottle believed to have been used in the attack on the Skripals and then discarded. What's so great about Salisbury? Mr Skripal's house and 11 other potentially infected sites were ruled safe on 1 March. Britain has accused Russia of carrying out the poisonings.